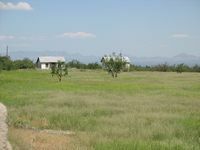 AVA Ranch - Cochise County, Arizona, Headquarters West Ltd. 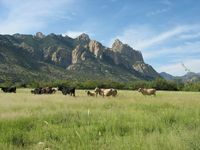 The AVA Ranch is located on the eastern flank of the Chiricahua Mountains in Cochise County, Arizona. 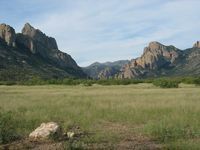 The property lies at the mouth of Cave Creek Canyon, a perennial stream that flows eastward from the Chiricahua Mountains into the San Simon Valley. The small community of Portal is adjacent to the property’s south boundary. Cave Creek Canyon is an internationally known area due to the abundance of bird species that live and migrate through the lush riparian canyon. Over 300 types of birds have been recorded here. 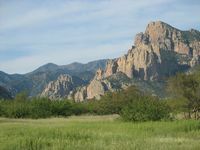 The biology of the region is unique due to the Chiricahua Mountain’s location between the Rocky Mountains in the United States and the Sierra Madre Mountains in Mexico. The American Museum of Natural History’s Southwestern Research Station is located in Cave Creek Canyon and provides lodging for many visiting scientists conducting research in the area. This area is also known for the quality and clarity of the night sky. Astronomers from throughout the world come here to observe the heavens. The remote location, low light pollution and low humidity provide an unparalleled opportunity to enjoy many astronomical sights. Arizona Sky Village, a subdivision developed exclusively for astronomy, is located here. An additional 180 Animal Unit Months (15 head annually) could be achieved with irrigation of native grasses on the 80 acres adjacent to the headquarters. 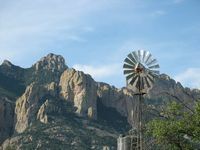 The AVA Ranch has a mild climate with Summer highs in the mid 90’s and Winter lows in the mid 30’s. Precipitation averages 17 inches per year. The elevation ranges from 4,600 to 6,000 feet above sea level. There are five wells on the AVA Ranch, one of which is an irrigation well that has a pump capacity of 500 gallons per minute. In addition, there is a surface water right for 3 acre feet annually on 48 deeded acres that is provided by a historic head gate and ditch from Cave Creek. This surface water right was adjudicated in 1920 and is very unique. There are four homes on the property. 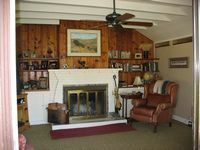 The owner’s home is a typical rambling ranch house that was constructed in approximately 1916. The three other homes are constructed of adobe and have been used as guest/labor houses. 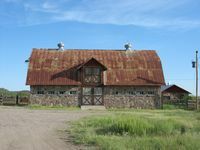 There is a large two story stone barn on the ranch that could be used for a variety of purposes. There are several additional outbuildings also constructed of stone. 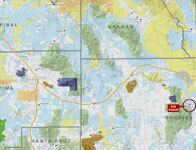 The land is classified as Cochise County RU-4 which allows minimum lot size of 4 acres. This area has experienced significant growth in the last decade. The AVA Ranch is the largest contiguous block of private land in the immediate Portal area. Please click here to download (about 8MB) a printable brochure in Adobe Acrobat format. If you get frustrated trying to make this work on your computer, don't hesitate to ask us to mail you a printed and bound brochure instead. 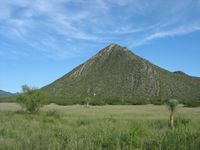 - If you are a birder, you may also be interested in the Three Links property along the San Pedro River.